These ships were the first Russian Dreadnoughts. 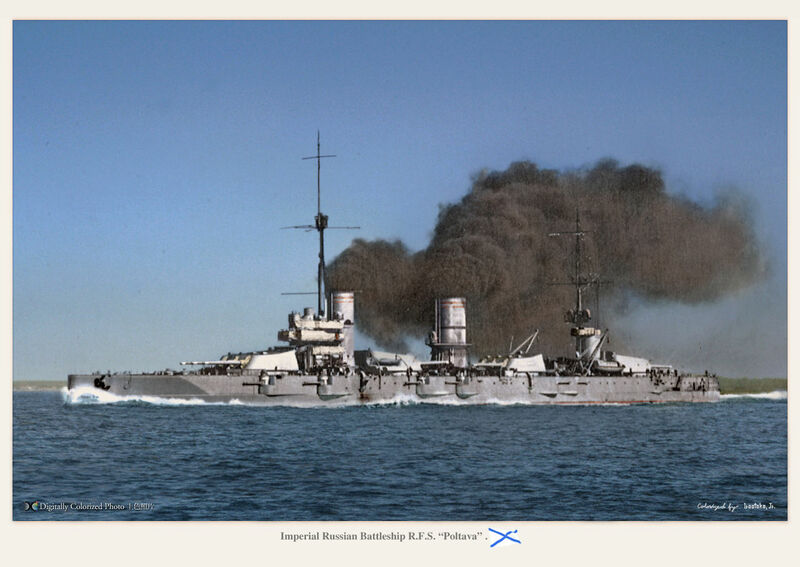 They were ordered by Tsar Nicholas II in person, and this despite a very agitated Duma (the revolt of 1905 was still fresh and these new ships were considered as a new expensive madness). The navy was also still tainted by the discredit of the Russo-Japanese war. Nevertheless, these ships were programmed as early as 1906, at the launching of HMS Dreadnought took place. However their plans were long prepared and debated. 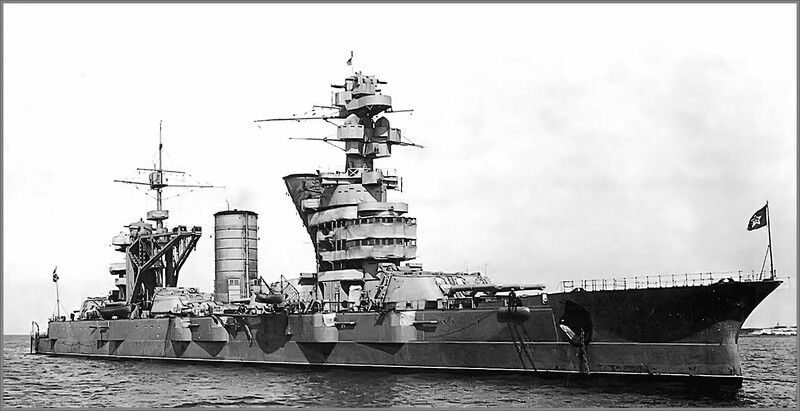 Eventually the Russian admiralty opted for a unique configuration at the time quite original: That of the main artillery placed at the same level (no superfiring turret) and all composed of triple turrets, all in the centerline. The German plans had been reworked with the assistance of engineers of John Brown NyD, but also the advice of Cuniberti. The unlikely international team arrived at an original compromise known then as the “dreadnought of the Baltic”, in which armor was sacrificed to speed. The order of construction which was to have been initially passed in Germany, met a strong opposition of the parliament, but also from France, by the voice of its ambassador. The Admiralty was forced by the prime minister to order the ship to the two major shipyards of St. Petersburg and the Admiralty shipyards of the Baltic, tailored with two large drydocks each. These four ships, Gangut, Petropavlovsk, Poltava and Sevastopol, were started at the same time on June 16, 1909, and accepted in service in November and December 1914. Having twelve 12-inches guns (305 mm) from the excellent Obukhov arsenal, all on the base level provided a low center of gravity, on a long hull tapered to the extreme. This made for a good, stable firing platform and low silhouette. This was compounded by a still impressive 12 piece battery rather rare at the time while being quite fast, before the apparition of the super-dreadnoughts. Barbette guns were Russian, hence the particularly light caliber, and were not satisfactory in service. They were too low, wet, obscured by water foam in heavy weather, and lacked effectiveness in range and hard-hitting power. Due to the imposing presence of the four turrets, superstructures were spartan, reduced to a few bridges stacked around armored towers and projectors wrapped around the funnels. Powerplant-wise, The very light boilers were from the new Yarrow model, allowing a gain in size and weight. Top speed was excellent, the Poltava on trials reaching 24,5 knots in light displacement, her machinery in forced heated was pushed to produce 52,000 hp. 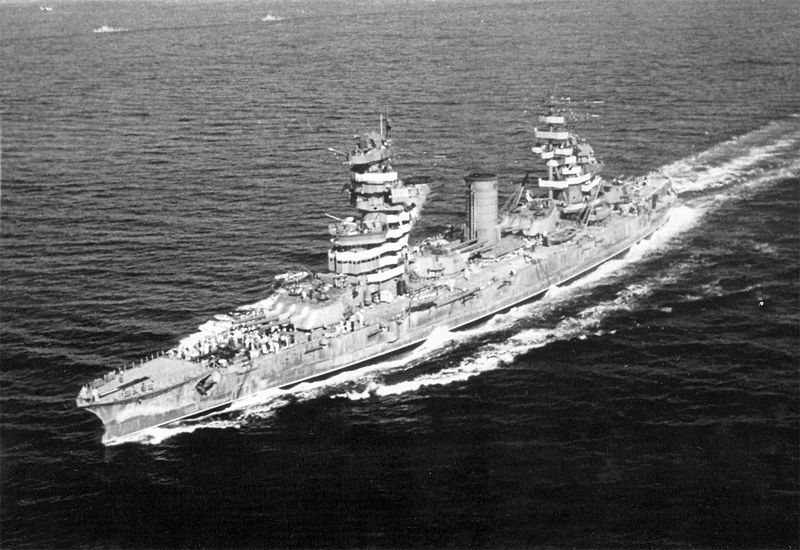 Another originality was that they were to be equipped with lattice poles of the model developed for the battleship Pervozvanni (a bit like slimmed-down versions of the American typical corbel masts), but in the light of models tests and excessive vibrations of the structures on these two battleships, they were finally replaced by reinforced single masts. The icebreaker bow, a Russian specificity, was preserved. Unfortunately, when the war broke out, none of these excellent ships were ready. 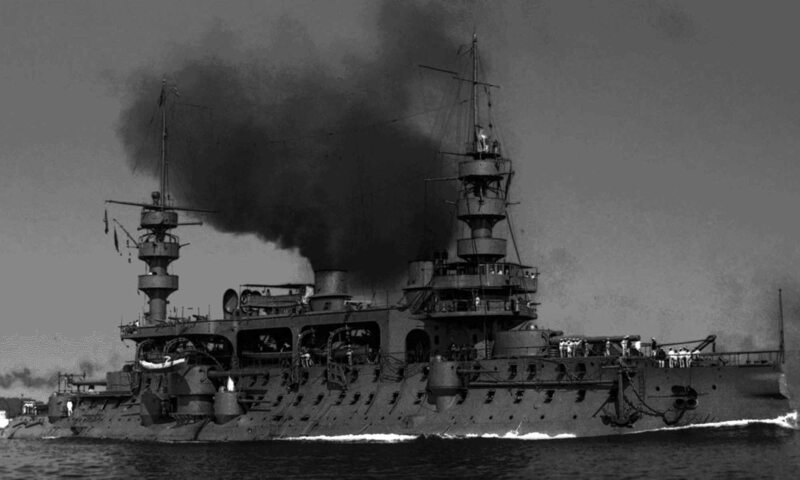 Their arrival into service in 1912 would have constituted a formidable potential threat for the Hochseeflotte. But problems with the hull’s longitudinal strength, associated with procrastination between the design office and Admiralty, the heaviness of Imperial administrative system made the completion dragging for more than two years while their unit cost rose to two million rubles at the time. In July-August 1917, the crews led by the Bolsheviks moved to the “red” side. They did not make an exit, based in Helsingfors, but the demobilization of the army in 1919, they had to flee in April and take refuge in Kronstadt to avoid the threat of hand-putting of the British. Petropavlovsk alone had enough experienced officers to carry out cover sorties to protect the passage of the rest of the Red Fleet at Kronstadt. His big pieces kept the English destroyers at bay. On August 17, 1918, however, he was the victim of a night attack in good standing of British stars including the CMB 31 and CMB 88 who gave him their 4 torpedoes on purpose. Poorly protected, the Petropavlovsk sank and landed on the bottom. The other three battleships suffered from a lack of maintenance which caused a devastating fire on the Poltava at the wharf in November 1919. Too much damage, it was left to dock until 1925, when it was expected to use its hull for testing shooting. Renamed Frunze the following year, it was decided to repair it to make it operational, which finally only came very slowly. In 1936, this project was abandoned, and it remained docked as a utility hull (sunk in 1941). The other three were renamed in the 1920s and rebuilt. They were renamed, Petropavlovsk becoming the Marat (an homage to the French XVIIIth century revolutionary), Sevastopol, Parizhkaia Kommuna (“Paris commune”, about the 1870 communist revolt), and Gangut, Oktyabrskaya Revoluciya. They were the spearhead of the new Soviet navy on the eve of the Second World War. Propulsion: 4 shaft VTE, 25 Yarrow boilers, 42,000 hp. 23 knots. 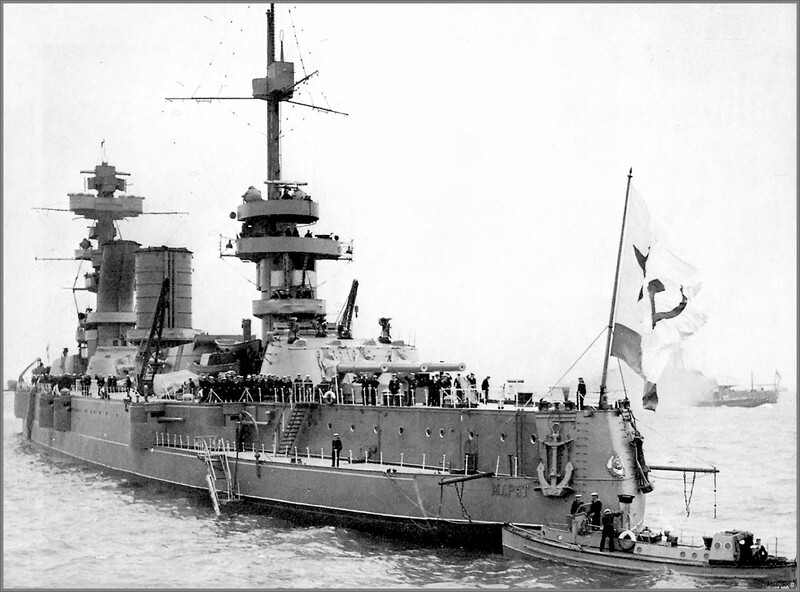 The only ships of the Soviet fleet in 1941 were these reconstructed dreadnoughts, a solution adopted in most navies. 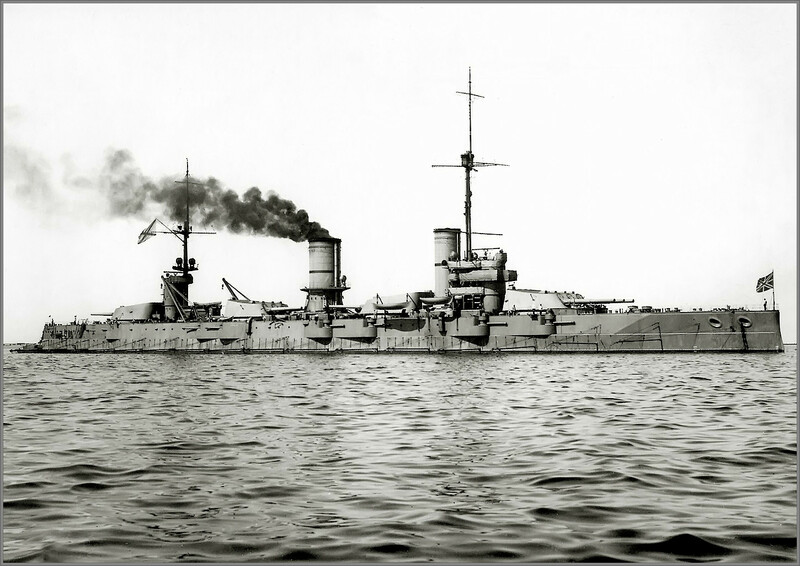 The initial Gangut class provided for the construction of four units, the first Russian dreadnoughts. The Poltava had been severely damaged during the civil war and remained in a sorry state, never put back into service and while she was renamed Frunze, whe was only maintained later to be cannibalized for the benefit of the other three. In 1925 she has been deleted from the lists. The other three were rebuilt from top to bottom. Marat was the lead ship for reconstruction, which happened between 1928 and 8 April 1931. -Anti-aircraft armament augmented with 75 mm and 37 mm guns plus 12.7 mm twin DshK heavy machine-gun twin mounts. -Boilers converted to fuel oil only. -Enough steam was produced that the forward three boilers were removed. -Former forward boiler room turned into AA magazines and new compartments. -Forward funnel angled to the rear, extended to deflect exhaust fumes out of gunnery rangefinders. -False bow and forecastle for sea-keeping. 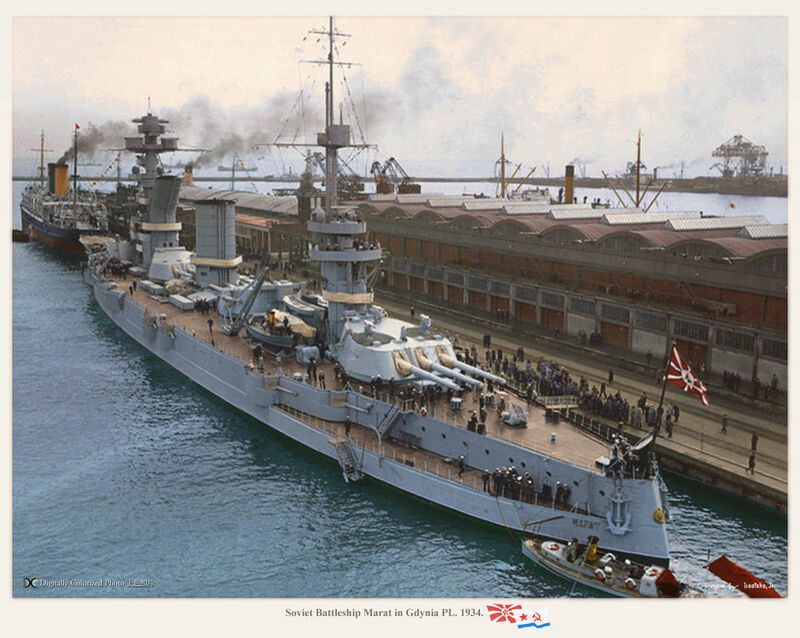 -Boilers were replaced by a dozen modern oil-fired boilers (from the same battlecruiser Izmail). -Longitudinal watertight bulkhead was placed on the freed space, improving internal protection. -Tubular foremast was replaced by a semi-conical mast. -Brand new aft structure was built, front of the rear conning tower, and mainmast moved forward. -Forward funnel was curved out of the bridges. -Turret roofs received 152 mm (6.0 in) of armor. -Forward funnel with a more pronounced curve to deflect exhaust fumes. In 1938 she was to be done with these, but returned to drydock from December 1939 until July 1940 for the fitting of a new armored deck plus bulges. This cured new found stability problems due to the new heavy superstructures, at the expense of a bit of speed. It should be added that they all kept their secondary artillery of 152 mm (6 in) guns in barbettes. Oktyabrskaya Revolutsiya (Formerly Gangut) after her modernization. They were all in service in 1941 and suffered the shock of the German offensive. Before that, the Revoluciya and the Kommuna carried out coastal bombing on the Finnish front. The Marat was assigned to him in the Black Sea. The first two lost their catapult, their crane in favor of an additional AA armament. By priority, these three ships were assigned as floating batteries, embossed, losing a few pieces of 120 mm in barbettes, sent in coastal batteries, and with a third of their crew (gunners). The Marat was badly hit by the Luftwaffe and sank in the harbor of Kronstadt, on the bottoms however high enough to continue to serve as a floating battery and was not bailed out after the conflict. 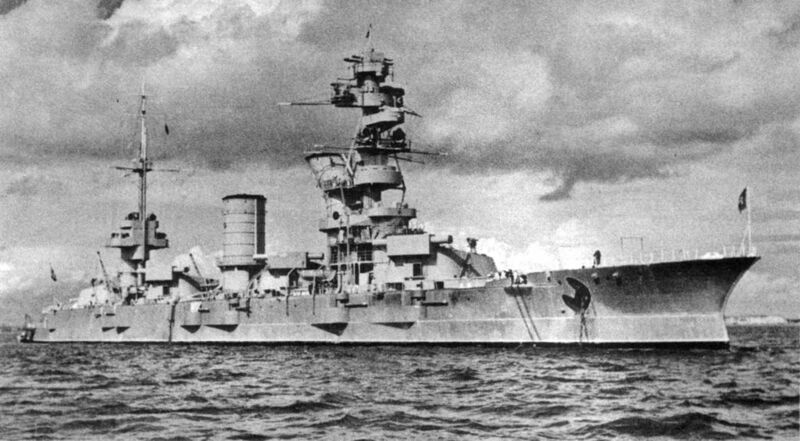 The Revolucya, also present in Konstadt, was less damaged and brought to Leningrad for repairs. It was bombed again in 1942, but repaired again, it was used on the offensive of winter 44. Its armament was reinforced and it received more effective fire control equipment and radar. It served as a training ship after the war, until 1959. The Kommuna participated in the coastal bombing but was badly damaged by the Luftwaffe bombers and taken to Poti for repairs. It did not come out again until the end of the war and was demolished in 1957. Parizhskaya Kommuna (ex-Sevastopol) after modernization. Propulsion: 4 shaft geared turbines, 25 Yarrow boilers, 42,000 hp. 23 knots max. Armor: 230 to 254 mm max. 4 x 533 mm TTs (21 in) sub.